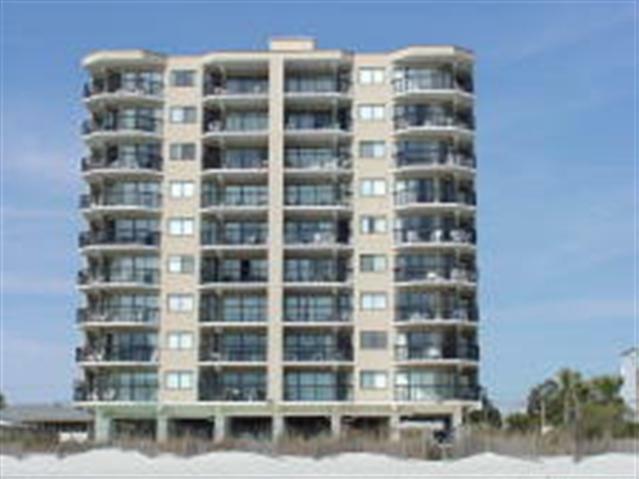 The Crescent Beach section of Myrtle Beach is home to the beautiful Crescent Towers II, which offers two and three-bedroom condominium residences with fantastic ocean views. Crescent Towers II has become a popular investment opportunity, as well, as this prime piece of Myrtle Beach real estate is just steps from the pristine white sand beaches. Read more about Crescent Towers real estate. Located along South Ocean Boulevard, in the quieter section of North Myrtle Beach, Crescent Towers II may seem far from the hustle and bustle of the downtown area, yet it is conveniently located only minutes from the excitement and entertainment of North Myrtle Beach and Myrtle Beach. The villas of Crescent Towers II feature two bathrooms and an oceanfront location. Each unit is also equipped with a host of amenities, including televisions, VCRs/DVDs, a fully equipped kitchen, high-speed wireless Internet and a washer and dryer. All of the amenities and conveniences of home are found at Crescent Towers II! This high-rise building, which seems to rise right out of the white sand dunes, faces the ocean, which affords its residents and guests second-to-none views of the Atlantic Ocean. Its contemporary design is sleek and attractive, and all units boast spacious rooms with great views. The beautiful, oceanfront outdoor pool and sundeck further compliments this resort’s luxury feeling. Taking a refreshing swim or simply relaxing the day away underneath the warm, North Carolina sunshine is easily accomplished at Crescent Towers II!